This case study assesses the Cortes Forestry General Partnership (CFGP) in the traditional territory of the Klahoose Nation on Cortes Island, BC, Canada. The CFGP is an equal partnership between the Klahoose Forestry No.2 Limited Partnership and Cortes Community Forest Cooperative, which has a Community Forest Agreement (CFA) for 3,869 hectares of crown land. This case study uses a variety of information to assess the tenure arrangement and how the community forest is achieving its goals, as well as the effects of the different stakeholders. Both the Klahoose Nation and the local community have been trying to gain tenure over the Islands crown land, with the intent of ecosystem-base stewardship for a couple decades. The CFGP is 5 years into a 25-year agreement allowing for some reflection on the community forest. Similar ecosystem as what would be found on Cortes Island.By Sang Trinh via Flickr. CC BY 2.0. The Cortes Forestry General Partnership (CFGP) is located on Cortes Island which is on the west coast of British Columbia, Canada. The island is about 136 square kilometers in size and has a population of 1,035 people as of 2016. The island is considered the Northernmost Gulf Island and much of the inner island is made up of rocky hills and well drained basins of productive forests. Prior contact of European explorers and settlers the Klahoose First Nations people live in what is now called Squirrel Cove in the summer months and up Toba Inlet during the rest of the year, they have existed on Cortes Island before memory. In the 1800’s the Indian Agents allocated 10 reserves to the Klahoose Nation. In 1866 the white setters came to Cortes, the first being Michael Mason. In 1890’s the Klahoose Nation relocated to Squirrel Cove, which is now their primary village and there are about 75 full-time members living on Cortes. In the late 1800’s and early 1900’s homesteaders cleared and burned old growth forests to create agricultural land. In 1969 the 16-car ferry, Cortes Queen, began shuttling cars between Quadra and Cortes, not long after in 1970 electric power first came to the Island. British Columbia (BC) has had a long history of exploitation and resource extraction. The forestry industry was causing concern in the 1940’s because companies were not harvesting sustainably and not appropriately provisioning forests for the future. In 1945 the Commissioner, Chief Justice Gordon Sloan, recommended in a report for the Royal Commission of inquiry that community forests should be used to improve stability in the industry. On Cortes Island in the 1950’s and 1960’s MacMillan Bloedel began prime forest lands from homesteading families. In 1988 the Cortes Island Forestry Committee (CIFC) was created because of clear cut logging that was happening on private land which caused concern amongst the local community. In 1990 MacMillan Bloedel were planning to clear-cut on lands next to the Klahoose village in Squire Cove. Klahoose residents led a protest against this clear-cutting and gained the support of some non-Indigenous residents, there was a total of 124 people who participated in the 2-day blockade. Cortes Island Forestry Committee commissioned Silva Forestry Consultants in 1992 to create an Island forest plan. In 1993 the British Columbia Treaty Commission was created to allow Canada, British Columbia, and First Nations to negotiate. In 1993 Cortes Island Forestry Committee reluctantly accepted a partial-cutting plan and logging continued on Cortes until 1998. On July 1998, the provincial government created the Community Forest Agreement, which was the newest kind of BC’s forest tenure. In 1998 the Cortes Island Forestry Committee was replaced by the Cortes Ecoforestry Society (CES) to give the non-Indigenous residents representation by an official entity. In November 1998, both Klahoose First Nations and Cortes Ecoforestry Society made purchase proposals for MacMillan Bloedels land on Cortes, they agreed to stop logging on Cortes until the two groups resolved negotiations. The two groups realized quickly how difficult it would be to raise enough money for the properties . 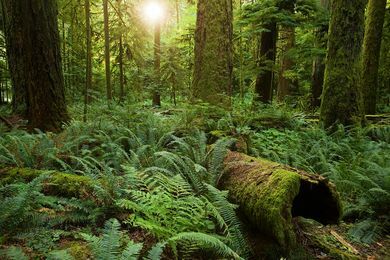 In July 1999, a Memorandum was signed by the Klahoose and Cortes Ecoforestry Society stating that the two parties would work together to create a community forest that uses eco-system forestry. In the Fall of 1999 MacMillan Bloedel was bought by Weyerhaeuser. In 1999 and 2000 the Cortes Ecoforestry Society began planning and preparing a community forest proposal. The Cortes Initiative was created from negotiations between the Klahoose Nation, Cortes Ecoforestry Society and Weyerhaeuser, it proposed that Weyerhaeuser would trade their land on Cortes for crown land somewhere else and then the crown land could be used for a community forest and managed with ecosystem-based principles. In May 2000, the Cortes Initiative proposal was turned down by the Minister of Forests because Weyerhaeuser wanted too much for their land. In 2005, Weyerhaeuser’s coastal operations were sold to Brascan Corporation, and the land on Cortes was taken over by Island Timberlands which is a subsidiary company. The companies land was slowly sold off and the Cortes Ecoforestry Society fizzled out as well. On May 19th 2011, the Cortes Community Forest Advisory Group (CCFAG) were invited to apply for a Community Forest Agreement (CFA) by the Minister of Forests, and on September 2013 the Ministry of Forests Lands and Natural Resource Operations issued a Community Forest Agreement to the Cortes Forestry General Partnership which was established on June 2012 . The tenure agreement between Cortes Forestry General Partnership and the Province of British Columbia is a community forest agree. The Ministry describes a community forest agreement as “A community forest agreement (CFA) is an area-based forest licence managed by a local government, community group, First Nation, or combination of local governments, First Nations and community groups, for the benefit of the entire community.”. The Cortes Forestry General Partnership is managed and governed equally by two partners, the Klahoose Forestry No. 2 Limited Partnership (KF2LP) and the Cortes Community Forest Co-operative. The tenure agreement lasts for 25 years and it encompasses 3,869 hectares of crown land which is about 35% of the Island . The Klahoose Nation holds ancestral tenure over Cortes Island, they are currently in the process of negotiating a treaty agreement with the province of British Columbia and Canadian government. They are at stage 4 in the process, which Is where the main part of the treaty is negotiated . The CFGP owns the tenure but does not own equipment. The CFGP will not provide training or funding for training. The CFGP will meet or exceed all provincial regulations. The CFGP will support the local economy through log sales and hiring contractors. Harvest of mushrooms, botanicals, tree boughs and the like will not be regulated by the CFGP at this time. This is a subsidiary of the Qathen Xwegus Management Corporation which is the Klahoose First Nation’s Economic development corporation, they work closely with the band government. Band government is made up of, Chief Kevin Peacey, Councillor Billy Barnes, Councillor Hellen Hanson, and Councillor Michelle Robinson. This company is meant to represent the interests of the Klahoose community in managing the community forest. The Cortes Community Forest Co-operative is a legal cooperative association, it is made up of a directors and members of the association. One must purchase a $25 membership share which allows one to vote in the election of the board of directors. An investment share can be purchased as well for $500. There is no limit to the number of members allowed in the cooperative and each member is allowed one vote, regardless of how many membership shares or investment shares they own. The first annual general meeting is when election of the Board of Directors occurs. Between three and seven directors are elected or appointed. One director is elected for a 4-year term, one director is elected for a 2-year term, and the rest are elected for 3-year terms. Written records, minutes of every meeting and resolution are kept. Funds from the co-operative can either be reinvested into the business, put into a contingency fund, used towards the local ecosystems, or into the Islands community. The CFGC understands the benefits of a healthy ecosystem and how proper management can improve the health and benefits of the community forest and they are striving to lead in sustainable forestry. The community forest plans on providing accurate information for further generations and helping prepare for climate change by creating benchmarks to compare performance with, creating sample plots, identifying research that will increase effectiveness, and setting up long-term monitoring areas for forest health and impacts. The community forest plans to have effective, proactive, and positive communication with the community. Supporting the local community is a priority of the community forest, they are trying to do this by being consistent with annual harvesting, prioritizing local wood processors needs, hiring locally where possible, providing the community with firewood and returning profits to the community. They aim to nurture pride in the community around the community forest. Since the late 1980's, the Cortes community has been trying to get sustainable forestry on the Island. Due to the community’s strong values, determination, and active engagement they have finally acquired a community forest agreement from the province, allowing them to manage the islands crown land in a sustainable manner. The CFGC has successfully harvested 11,500 cubic metres of timber over four harvests. They have sold 2,000 cubic metres to local mills, 1,400 cubic metres of firewood to the community and planted 16,000 seedlings. The community forest has demonstrated active community engagement and communication by have 6-12 website updates, 2-5 site tours, 6-10 post on the online notice board per year between 2015-2018. Over the twenty plus years leading up to the community forest agreement with the CFGP, the community faced many challenges. In the 1980s, forestry companies logged on privately owned land and had little communication with the community. The late 1980’s Cortes Island Forestry Committee negotiated with logging companies and the ministry to encourage them to be ecologically responsible. They also promoted community awareness and the idea of a community forest (Bullock.). In 1990, there was a 2-day blockade lead by the Klahoose community which was protesting the MacMillan Bloedel clearcutting operation that was about to begin next to the Squirrel Cove village without any notice (Bullock). The community tried negotiating with the logging companies and the ministry but because of frequent changes in ownership of these corporations and changing provincial governments which were already uncooperative, the community had difficulty acquiring a community forest. The residents of Cortes individually have little power but when they get together and form groups like the Cortes Community Forest Co-operative, their power increases because they can organize and make their voices louder. It is similar for the Klahoose residents who have more power when a governing body represent them and their values. This is clear in the example of the 1990 2-day blockade where the Klahoose community and the non-Indigenous community came together to fight against large-scale clear-cutting on the island, and they got the logging company to stop for awhile. Unfortunately, they only had so much power and a few years later the company came back and continued logging. Since these companies were logging on private property the community couldn’t do much without the support of the provincial government. The provincial government of BC holds a lot of power because they have legal tenure over all of the crown land which is about 95% of the land in BC. Once the Cortes Forestry General Partnership acquired a community forest agreement, it gave them more power because they had limited tenure for the crown land on Cortes, which allowed them to manage the forest how they wished as long as they meet or exceed the provincial regulations. The Cortes community had a challenging time acquiring a community forest agreement, but it forced them to develop a strong plan. The Cortes Forestry General Partnership has a strong operations plan, not only does it strive to have ecologically sustainable practices but it also is aware of the importance of community engagement and communication. The CFGP should stick to their management plan, continue listening to the local community and adapting to the changes in best practices. They have a strong start with following eco-system based forest management. After the 25-year community forest agreement is over the ministry should give them a 99-year agreement. ↑ 4.004.014.024.034.044.054.064.074.084.094.104.11 Bullock, R.C.L. ; Hanna, K.S. (2012). Community forestry: local values, conflict and forest governance. pp. 106–112. This conservation resource was created by Sean Larsen. It has been viewed over 0 times.